Petflation November Update – Have prices peaked for the year? The CPI data for November is out – a pretty “normal” month overall – for a change. The total pet market prices didn’t change much +0.17%. Every segment was up. Pet Supplies prices were up but the increase was less than half that of 2013. The Pet Food CPI was up – just barely. Service prices were both up about 0.2%. This is about twice the normal November increase. So we stand at what is the “normal” pricing peak for the year. In recent years December has brought precipitous drops in Food and Supplies prices, driving the Total Pet Market pricing down. Vet Service CPI – Up 0.18% over October – Higher than normal. Pet Services – Up -0.21% over October – Higher than normal. Pet Supplies – Up 0.31% over October– About ½ usual jump for November. Pet Food – Up 0.03% from October – Essentially flat. Total Pet – Up -0.17% from October – All segments up. 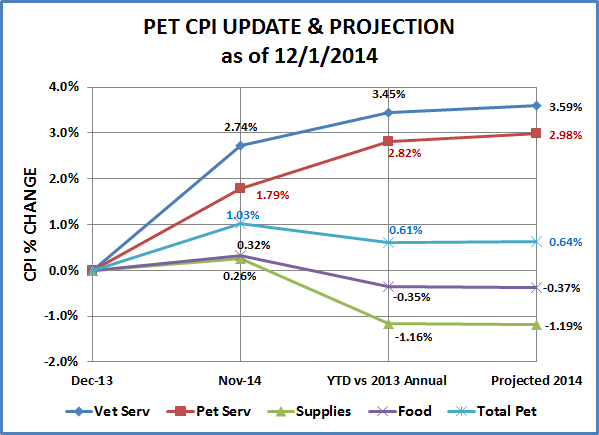 The Total Pet 2014 CPI projection is inching upward. It’s now at +0.64% versus + 0.62% last month and +0.60% two months ago. This is primarily being “fueled” by increases in the Supplies Segment. The Service segments have slowed their rate of increase and Food Prices have become essentially flat. Here’s what the last 15 months of CPI’s look like. Vet Services – Prices are 3.2% higher than they were a year ago. The usual Fall price increases have been lower than normal. In recent years, the December CPI change has been inconsistent in this segment, ranging from No Change to +0.6%. Expect an increase of about 0.3% in December and an annual CPI increasea of 3.6%. Much of this was driven by strong increases in the first half of 2014. Services Total – There will still be a 3+% increase in prices for the year but it was almost all generated in the first half of the year as price increases have slowed markedly since June. As was stated in an earlier Post, without the increases in Vet & Non-vet Services, Total Pet Prices would be down for the year! 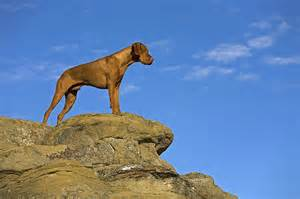 Pet Food – Pet Food prices are -0.1% lower than they were a year ago. They are also only 1.0% higher than they were 2 years ago. That means that the prices in this largest Pet Segment have been essentially flat or down for 2 consecutive years. The Food and Treats segment has become increasingly price competitive as the Consumers have become more “value conscious” in their shopping habits. Expect prices to drop -0.4% in December and the overall CPI to fall -0.4% for the year. Pet Supplies – Prices went up 0.31% in November, which is just slightly less than ½ of last year’s increase (+0.7%). Three consecutive months of strong increases have brought Supply prices back somewhat, -0.5% below where they were 1 year ago. They are still -3.5% below the prices in November of 2011. Expect prices to drop -0.7% in December, resulting in a CPI drop of -1.19% for the year. 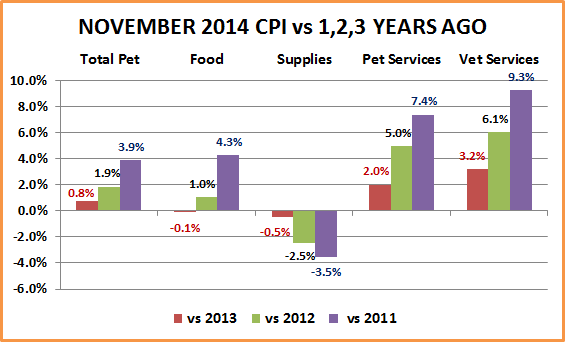 Pet Food & Supplies – These segments are about -0.5% below where they were in November 2013 and -0.3% below 2012. Taken together the prices in these Product segments have basically been flat to just “below the surface” for about 2 years. Expect a drop of -0.6% in December and -0.9% for the year. Total Pet – Prices are 0.8% higher than they were 1 year ago. This is driven totally by the Service Segments as Pet Products prices are down. 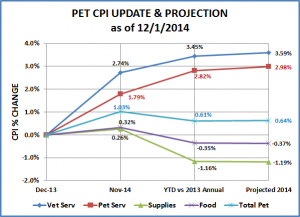 We should see an overall increase of 0.64% in the Total Pet CPI for 2014. This would be second only to 2010 which had a 0.62% price increase over 2009. It will be close. In fact if Service Price increases are less than expected and Product Prices have a deeper drop…we could see a new low. Question for December – Will the price drop in December be even greater than expected? We noted in a recent post that overall the November Retail Lift for 2014 was about the same or a little less than 2013. In fact, sales in the Miscellaneous Store Channel (includes Pet & Gift Stores) were actually less than 2013 – no lift, a drop. Will the pressure to make yearend numbers result in even deeper and more widespread discounts than usual? We’ll see. Prices are prices…Why the concern about inflation or deflation? Because extremes of either, especially over an extended period of time, can severely affect a segment or even the whole market. Let’s look at an inflation example – Veterinary Services. For 16 years the annual inflation rate averaged 5.0%. The segment continued to show growth beyond just price increases…until 2011, when for the first time consumers actually bought less in terms of the amount of Veterinary Services. In 2012 they bought even less and the amount of Veterinary Services in 2013 was effectively the same as it was in 2010. What’s next for this segment remains to be seen. Pet Insurance, consolidation of clinics, an increased number of OTC medications, home testing…all could be possibilities…if they help to mitigate the cost of Veterinary visits. The consumer has become more value driven since the “great recession” and price increases must be reasonable…or they find an alternative or buy less. This behavior is most noticeable in discretionary spending but it also affects “essentials” like food and veterinary services. Deflation is most common when a product group becomes commoditized and there is an abundance of supply. With no demonstrable difference in quality, price becomes the overriding factor to the consumer. Let’s look at a nonpet market that affects us all – oil. OPEC producers have decided to keep oil supplies extraordinarily high. This has produced a precipitous drop in gasoline prices…great news, right? Initially, yes. However, there may be some costs to the consumer in this strategy. OPEC countries produce oil cheaply and have a greater profit margin than some of the alternative production methods being employed elsewhere. These producers have a lower margin. They must be competitive so a substantial drop in retail prices results in either NO sales or turns low margins into NO margins…they can’t afford to run their businesses…so they will start to close them. This will ultimately cost thousands of jobs but gasoline prices are still low, right? That’s right. However, when a substantial number of “alternative” competitors have gone out of business, the OPEC members could decide to start scaling back production. As supplies fall, the prices start back up. To what level? With less competition, the OPEC members now have greater control…so it’s up to them. They can sacrifice margin for a period of time to reduce competition. As prices rise, some of the “alternative” competitors will come back…but fewer than before. Of course, the OPEC members can start the whole process over again. As we have noted in an earlier post, deflation in the Human Toys market began in 1997 and prices have fallen ever since. The result: There are far fewer manufacturers competing in this category. We have only 1 major Retail Toy store chain left and they are on shaky ground. The retail sales in this market have migrated to general merchandise stores and the internet. In fact 30% of all toy sales are done by 1 National General Merchandise Store chain. We are seeing indications of consistent deflation in the Pet Supplies segment and some initial signs in the Food Segment. Driven by the commoditization of more and more categories, overall Supply prices have been generally falling since 2009. This reduces margin which makes competing more difficult so companies start to “opt out”. There is less money to fund innovation and it becomes increasingly difficult for start ups. At retail, consumers start migrating… looking for value. What’s in store for Pet? That’s up to us. Run your business more efficiently. Keep price increases to a minimum. Consumers expect prices to go up over time, but reasonably. What is reasonable?…only the consumers decide and they don’t tell us in advance. 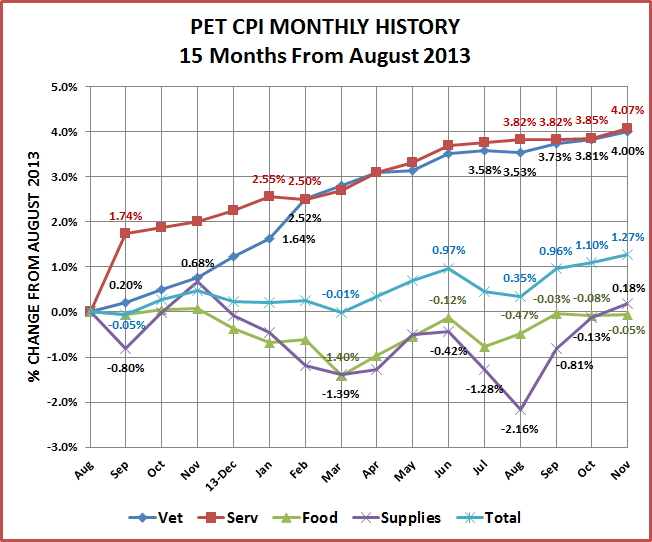 For the overall Pet Market it looks like a CPI increase in the 1-2% range is reasonable. Need more $? Innovate! People will pay more for a demonstrably better product. There is a lot of emotion in Pet Ownership. Consumers will also pay more for products with an “emotional” value. Some licensed products fit this description. Selection – Manufacturers and retailers should understand the consumer buying decision tree in each category and make sure they offer choices at the key decision waypoints. Retailers – Face it. You can’t build a store as big as the internet. You can offer online ordering with a larger selection…and when it makes sense, give them an in store pick up option…with a discount for their in store purchases. Get a fast start in 2015 and make it your best year ever!